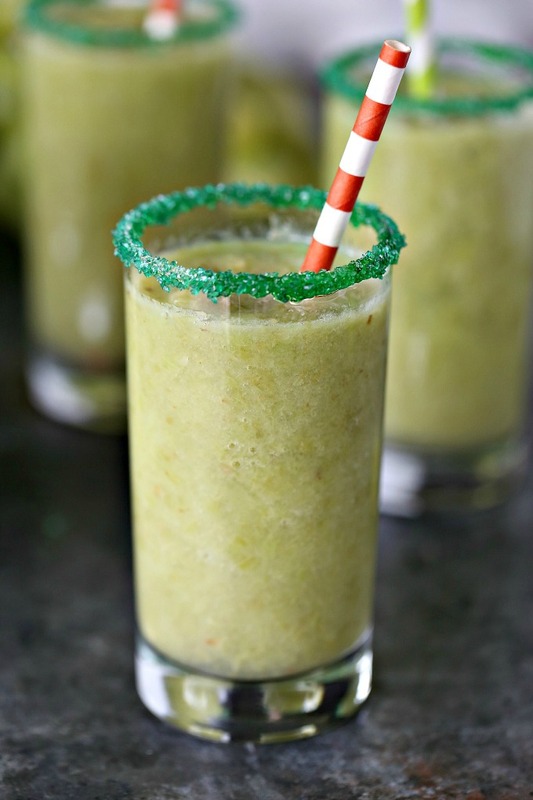 Green Grape Slushies are a super fun recipe you can make with the kids. Or send the kids to Gramma’s house for the night and whip up some Boozy Green Grape Slushies for yourself! This post has been sponsored by Produce Made Simple in partnership with Fruits from Chile. All thoughts and opinions are my own. Thanks to all the companies, and readers, who help support Cravings of a Lunatic. I’m thrilled that grape season is here so I can make these green grape slushies every single day! I’m a sucker for green grapes, especially when they are wicked cold. During grape season I’m known to pop frozen grapes in my mouth from morning till night. Ice cold grapes are the bomb. I could skip meals and just eat grapes all the live long day. Some days I prefer to sip my fruit instead of eating it. Slushies are HUGE in the Beaulieu household. I’ve been making homemade slushies since my kids were wee little hooligans. Now my kids are big hooligans but they still dig slushies. Personally I think everyone in the world digs slushies. I’m a slushie fanatic so I may be a bit biased. Kids love them because they are fun and colourful. Adults love them because they can pour booze in them! Am I right? Yeah, I know, I’m SO right! Boozy slushies are the bomb! 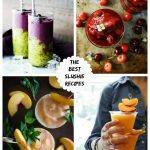 You can make slushies with any kind of fruit. Strawberries, watermelon, raspberries, cherries and even grapes. I’ve made them with every kind of grape known to man. My all time favourite grapes are Thompson Seedless Grapes from Chile. For me, quality counts when it comes to grapes. I take my snacks, and my sips, very seriously. 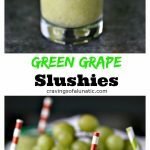 Keep reading to learn more about grapes or JUMP TO THE RECIPE FOR GREEN GRAPE SLUSHIES NOW! Pick plump, even-coloured grapes that are still attached to the stem! Pick bunches with green stems. Green stems equals fresher grapes! Green grapes will have a yellow hue when ripe! Red and purple grapes will be even-coloured! Remove grapes from the stem first. Rinse grapes with cool running water. Drain them well and pat dry with a clean cloth. Make sure they are completely dry. Line a rimmed cookie sheet with parchment paper. Transfer grapes onto cookie sheet and place in the fridge. Allow to freeze completely. Remove grapes from freezer and transfer them to an airtight freezer bag or container. You can store them in the freezer for 3 to 6 months. 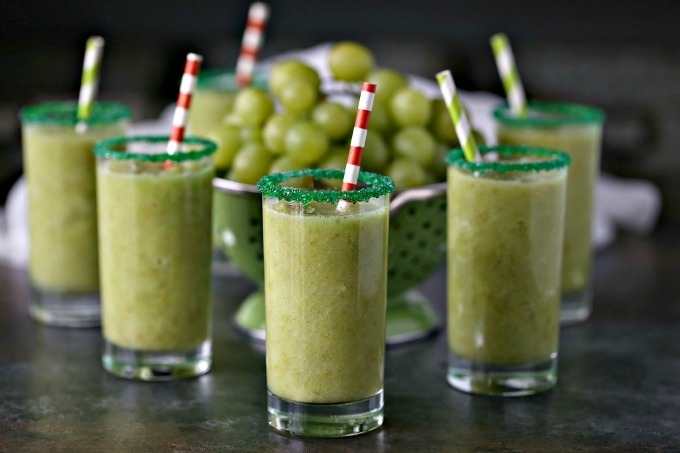 Make these green grape slushies for kid’s birthday parties or sleepovers. They are also perfect for St. Patrick’s Day too!! 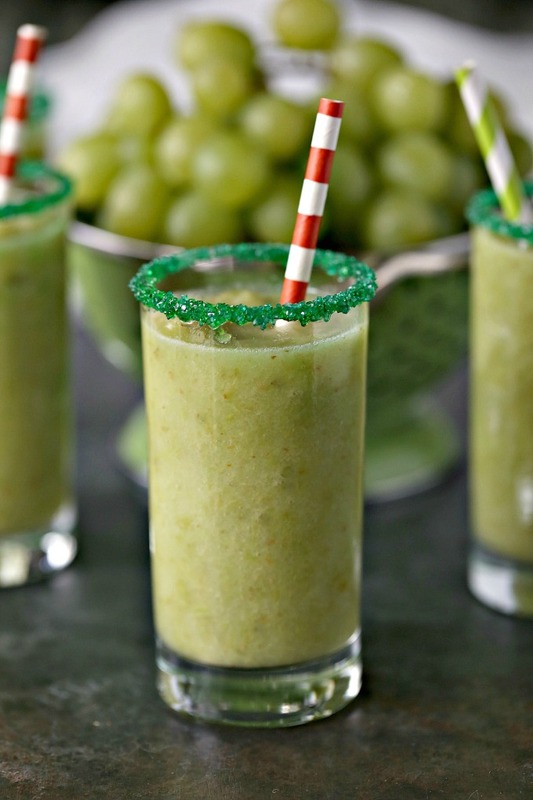 You can find the recipe for these Green Grape Slushies on their website. I made these slushies for my pals over at Produce Made Simple in partnership with Fruits from Chile. Swing by their website to learn more about grapes!! 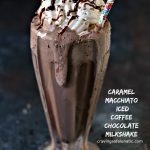 If you like this recipe be sure to check out my Caramel Dipped Grapes I made for them last year! If you’re looking for more great recipes, be sure to check out my recipe index! 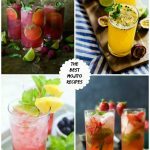 You can find tons of appetizer recipes and snack recipes. Also, take a minute to follow me on Pinterest. I’m always pinning great recipes, among other things. You should also follow me on Instagram. I share all my new recipes to Instagram when they come out. oh my! Grape slushies sounds amazing right now. I’m a huge fan of green grapes and ate pounds and pounds of them when I was pregnant with Jackson. I’ve never had grape slushies but I bet I would love them! Oooh, those sound so refreshing. 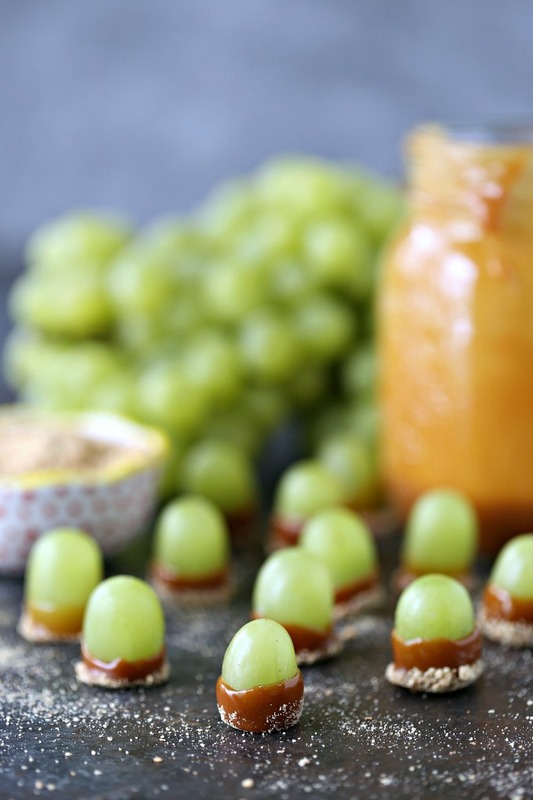 I’m a huge grape fan and I’m totally digging those caramel-dipped grapes, too, YUM. I would have never thought of putting grapes in slushies! Such a clever idea and I really appreciate those tips for picking grapes. That looks so refreshing. Such a pretty color and your glass dipping expertise is impressive. Yeah, I could have one of these any time of the year! We love green grapes! Will definitely be adding some white rum to this refreshing drink for an adult version. 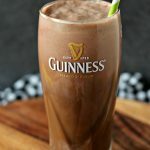 Perfect for a St. Paddy’s day treat and healthy too! What an excellent thirst quencher! We love grapes (frozen especially!) 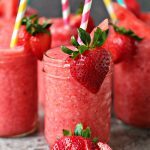 as well when the weather turns warm and I’m looking forward to trying these slushies soon! This looks so refreshing! Love that you used grapes here!